Cheap, easy-to-assemble tents are being used to shelter those on the streets, with some charities and campaign groups encouraging donations. But in some places, authorities are clamping down on homeless camps. "Loads of people on the streets swear by tents," says Steve, 27, who has been a rough sleeper since the age of 14. "I mean, they give you a bit of extra warmth, so it's a lot easier to stay out in the open than it is if you're just using a sleeping bag." The average age of death for a rough sleeper in England is just 47. Bad weather and fear of attack make life difficult and uncertain. Anecdotally, it appears it's becoming more common for homeless people to seek some shelter and degree of privacy in tents. While they "cannot begin to provide an adequate substitute for the roof, every person deserves over their head, any advantage a rough sleeper has against the elements could be the difference between life and death", says Jon Sparkes, chief executive of the homelessness charity Crisis. "There are loads more than there used to be," says Steve, who did not want to give his surname. He sleeps out in central London, having moved to the UK from Ireland. "People feel a bit safer in a tent. After all, it's harder to hurt someone by jumping on a tent than it is out in the open. Some people have been a bit stupid with where they're putting their tents and they get moved on, but most use their brains." The number of rough sleepers in England increased by 30% from 2014 to 2015, according to official figures. Many of those living outdoors in towns and cities have addictions and mental health problems. But not everyone thinks tents are a solution. Several camps formed in Manchester have been moved on over the past year, and the city's council has won an injunction against the pitching of tents on land it owns. Bristol Council has warned that charities and organisations urging the donation of tents to rough sleepers are encouraging anti-social behaviour and might be delaying those in need from seeking help. It's become easier to pitch a tent. Instant or pop-up versions allow people to set up their overnight accommodation in just a few seconds. They are light and fold up into near-flat containers, with basic models retailing in the UK for less than £20. There's been a strong drive to provide more of these tents in the US, where the government estimates that more than 500,000 people are homeless. The charity Tents-4-Homeless was set up in Los Angeles to encourage the public to donate tents and money to supply them. These "at least provide temporary protection against inclement weather and provide a small measure of dignity and privacy", says founder and director Peter Schey. Without the construction of "several hundred thousand new housing units", the situation will not ease, he argues, adding: "Until then, more and more homeless people will have no option other than to live in tents lining the streets of the richest nation on earth." About 20 tents are currently standing on a plot of land next to London Road in Manchester. The camp is the successor of several others in the city that have been disbanded or moved on since the first started outside the town hall in April last year as part of an anti-austerity protest. "The use of tents by homeless people is a recent thing," says solicitor Ben Taylor, who has represented those involved in the camps during their disputes with Manchester City Council. "I've worked with homeless people for 20 years and I've never seen large-scale use of tents until last year. Before, people tended to sleep under a bridge or in a driveway or on a park bench. Spots next to air vents were popular too." At points during the encampments, organisations appealed via Facebook for the public to donate tents - a smaller-scale version of what Tents-4-Homeless is doing in the US. This provoked widespread "sympathy and empathy", says Taylor, with some people buying tents, as well as jumpers, blankets and underwear, from nearby shops and bringing them to the camp. "There's a practical reason," he says. "If you are sleeping in a tent and there are five other tents next to it, you are less likely to get beaten up. The problem is that people coming out of nightclubs sometimes kick people. "If there are a few of you in tents, you can leave your stuff inside and go to the loo or a shop and someone can keep an eye on it for you. If you leave it out on the street, then it's gone. With tents there's a bit more of a community situation going on." A sizeable proportion of the early Manchester tent-dwellers was made up of activists, rather than the genuinely homeless, says Taylor, but the London Road camp is "100% homeless". In Bristol, the council has threatened to remove tents erected by rough sleepers in sites including Castle Park and St James Park. Nick Hooper, the council's director of housing solutions and crime reduction, has said some of those involved "start causing nuisance, anti-social behaviour, littering". 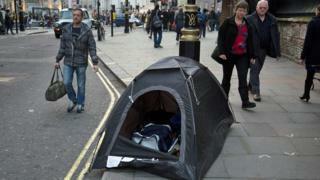 The authority warns that the use of tents could make it harder for charities and others looking to help the most needy. The UN High Commissioner for Refugees has said that even the organisation's own family tents, made to a higher specification than the most basic models, "are designed as a short-term shelter solution, particularly in support to emergency situations" and are "not a substitute for a more permanent shelter". One city where tents' use by the homeless has proved particularly controversial over a long period is Paris. In January 1954, Catholic priest and former MP Henri-Antoine Groues, better known as Abbe Pierre, launched an appeal for help after a homeless couple and a homeless single woman died of hypothermia. He sent an open letter to newspapers, saying: "Everyone can help those who are homeless. We need - tonight and, at the latest, tomorrow - 5,000 blankets, 300 big American tents, and 200 catalytic stoves." The appeal succeeded and Abbe Pierre had tents erected on the quays of the river Seine, partly a practical measure and partly for the propaganda effect. In 1956, a government minister said those involved should "go sleep under the bridges" of Paris instead, hidden from wider public view. Fifty years later, in 2006, another camp grew by the Saint-Martin canal in north-east Paris, the tents bearing the initials SDF, standing for "sans domicile fixe" ("without a fixed abode"). A group called the Children of Don Quixote set up around 100 tents, inviting people to come and spend time with the residents. The camp lasted for three months. An attempt to build a successor in December 2007 was stopped by police. The current Manchester camp is on ground owned by Manchester University, which says it has made "clear that we have not consented to this use of this land" and "reserves all rights to take appropriate steps to require vacation of the land". But it adds that it is a "large and inclusive institution, with a clear commitment to social responsibility". "We'll have to see what happens," says Steve, "but I know that until things get a lot better there'll be a lot of people using tents." Rough sleepers are people who are living in places not designed for habitation - such as old cars, sheds or stairwells - and people sleeping, bedding down or about to bed down in the open air. This includes those who use tents, unless they're part of "campsites or other sites used for recreational purposes or organised protest"